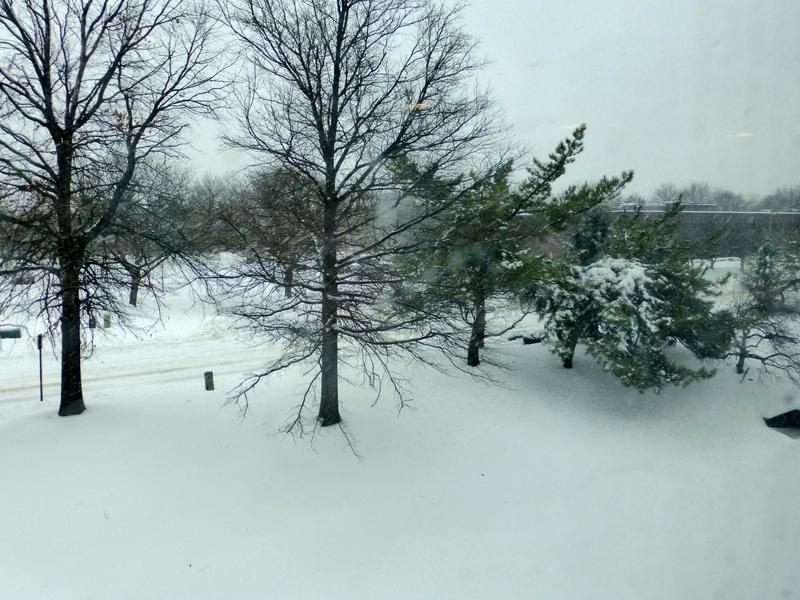 This bleak, frigid landscape outside Kongo’s office window in Moorestown, New Jersey underscores his simian feelings caused by a Valentine Day spent away from his heart throb. It’s not the first time this has happened. Hopefully it will be the last. You see, despite the monkey’s best intentions the Pax Storm ( who names these storms anyway. This Nor’easter was anything but peaceful) AKA the Valentine Storm trapped Kongo on the East Coast. Instead of an early flight out yesterday morning to rendezvous with Mrs. Kongo and a special dinner reservation, sheets of ice trumped valor and Kongo was stuck. Two dozen long-stemmed roses quickly went speeding across the internet but did little to assuage the “I knew this was going to happen …” reaction from Mrs. Kongo. The monkey, who was going back to 80-degree weather in San Diego for another “Slam Bam” weekend was going to fly back here on Monday anyway. Now he gets to spend the weekend here as well. Naturally it’s a holiday weekend. Travel safe. Have fun. Love the one you’re with. Poor Kongo. I do see a trio of monochromatic snow shots that would make great framing though…. I’ll work on that, JoAnne! The big defrost must be due soon! Happy Valentine’s Day anyway! Poor Kongo, but I think he (and his collection of quotes) have enough wisdom in them for this time. The last photo is precious! It should touch Mrs. Kongo’s heart. Dream of warmer climes. Sorry you got hit by all this cold, too! Life goes on. I should be at home in 85 degree weather. Next weekend. Hopefully.